I earlier posted "How to sort emails into folders", "Download Office Mobile 2010" & "Choose custom personalized email ids with CoolHotmail", you may like to check these cool features of Hotmail. Though the new Windows live may be unavailable for some, but every user will be updated by the end of this summer.Check your inbox if updated or not. Microsoft has kept Gmail into target and made it better. Microsoft has added SmartScreen to prevent spams and phishing attacks. This would minimize spam in inbox up to 1% not 0% however. But do you know according to study there are 4% of spams in your inbox in Gmail, spams succeed to bypass the spam filter. Microsoft SmartScreen is used also in Microsoft Forefront, Exchange, and (for anti-phishing) Windows Internet Explorer 8. SmartScreen technology is based on IP reputations, user reporting, third-party sources, semantics, botnet detection, signature recognition, mail formats, and more. When you login to your hotmail account you can see appointments, birthday reminders, network updates, news, latest email etc. on the front page in a new look. Recently I wrote a blog post How to use custom filters to autosort emails into folders, for various purpose. New Hotmail is a step ahead, it has already created some preset filters for social networks like facebook, linkedin. Emails from these sites is auto sorted into social update networks. But I recommend you to make your custom filters, so the different folders for different sites. The screen shot shows it was difficult (not too difficult either if you follow my instructions) to create custom filters for auto sorting in the earlier hotmail. Quick view enables you to see emails and photos from your entire account, in any folder they contain (say inbox, facebook, except junk), from different email accounts if you have added more than one to your account. Yeah that's possible in Live Hotmail. The advanced-made-easy search can search from emails with auto complete. They say there is no need of further advanced search, but still if you want then it's available. I really needed an advanced search. Just like Gmail If have a previous conversation with someone, the emails can be kept together with individual snippet. 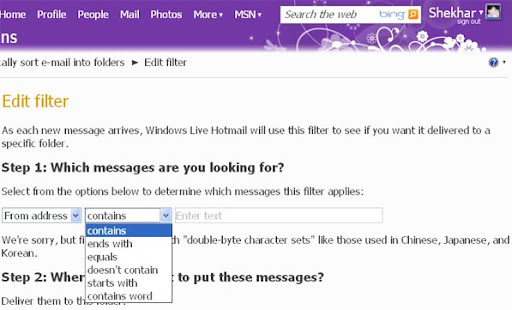 Conversation function is optional in Hotmail giving you more flexibility. Whereas in Gmail its permanent. I see some issues in Gmail snippet, it doesn't function well. With sweep you can remove any email from junk or inbox, and if you don't want to receive in future. You can also select the option of auto complete. Isn't it peculiar that Google give you 10GB of storage for mails and just 1GB in picasa web album? Forget that now, You can send attachments pdf,images, videos or any other files up to total of 10GB per email. For sending huge attachments the files will be first stored into windows skydrive and images into your albums. Hotmail has partnered with many third party platforms like YouTube, Linkedin Hulu, Flickr, Picasa, SmugMug and Justin.tv, so if any content(eg link to youtube video) is shared from these platforms, they can be directly viewed inside your inbox, instead of visiting the actual site and logging in etc. Now you can access contacts from all social networks like facebook, linkedin, twitter, orkut etc. in a single place. You can also create categories to organize your address book. This synchronizes the calender, contact & emails with all connected devices. Exchange ActiveSync is available on 300 million mobile phones as well as pc and web. Like me many mobile users access hotmail. The new Mobile Hotmail enhances the experience. This now features offline email viewing mode, conversation threading, messages flagging, header details, auto complete composing and more. You to view HTML and see the attachments. The light version of mobile browse will also be available. The feature rich mobile calender synchronizes with you devices. Microsoft and It's partners like Black Berry, Nokia have created many apps supporting over 1400 mobile phones. Recently Microsoft launched cloud based Office Suite, now it's also incorporated with Hotmail. You can view and edit your Word, Excel or PowerPoint attachments right from your inbox. Even if MS office is not installed in your computer. If you received an attachment, and want to make corrections. You can edit and forward on the same place. Hotmail is known for it's best security, even without a SSL. It's though to |-|ac|< hotmail accounts, better ask any |-|ac|<er. Hotmail now connects with your cellphone or any other device as proof of ownership. In case of loss of password or any compromise of your account(rare). Hotmail can send recapture code to regain the access. Gone are the days when you needed passwords, which can be |-|acked by phishing sites, keyloggers, Brute force or other ways. After enabling this feature hotmail will send you one time use code to log in via sms or other email added. Now phishers can't phish. Currently Hotmail log in is encrypted by SSL (Secured Socket Layer, https) encryption layer. But in near future, Like Gmail, the entire session will be having the SSL adding more security. You can build your safe sender list, don't forget to include me. This will put a safy logo after the senders id in message and never go to junk. I have covered all the important features on new hotmail. If you want to know more then you can visit [http://mail.live.com] login in hotmail and explore yourself. You can also read white papers if you want to do research or detailed study. Do you have any reason to hate Hotmail yet? Nice to see Hotmail back with top features . At last Microsoft is going to be careful about the user. @Tanmay Yeah, microsoft gifted great features to users. It was about time, huh? I think this changes are due to progressive losts of people to Gmail offcourse. @gbvaz because of other services provided by google, requires a google id (or a gmail id), anyways this may attract new users.